Hello friends! It is the end of a long, emotional few days — but ones that have me reflecting on the value of our fellow creatures, humans included. My recent adventures began with efforts to secure the safety of one previously unlucky dog whose time was up at a Los Angeles municipal shelter. It is these efforts that have served to remind me of my connection to other humans and the power of collaboration. 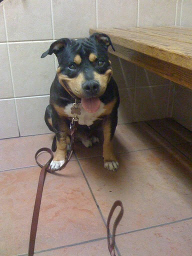 Georgie, a gentle Rottweiler-pit bull mix, was slated to be put to sleep one morning early this week. I had been circulating his photo and plea for adoption for weeks, but no one had stepped up. Many rescue groups wanted to help but were too overwhelmed with multiple animals in the same circumstances. Georgie needed an advocate, and for whatever reason, he crossed my path. I was trying to help him, but as my efforts were not yielding any results, I felt discouraged and so very sad for Georgie. I sent a final plea and soon found I would not have to give up on Georgie! The despair that threatened to overwhelm my efforts was replaced by the strength of good friend — the kind of strength that keeps us on-task and moving toward our goals. Adrienne provided me that strength, as she often does, and I love her for it. She helped me assemble a team of people to help Georgie, each one providing a step in his journey toward a forever home. Thanks, my friend! So I guess today, while I am sharing… finish the post by clicking here.